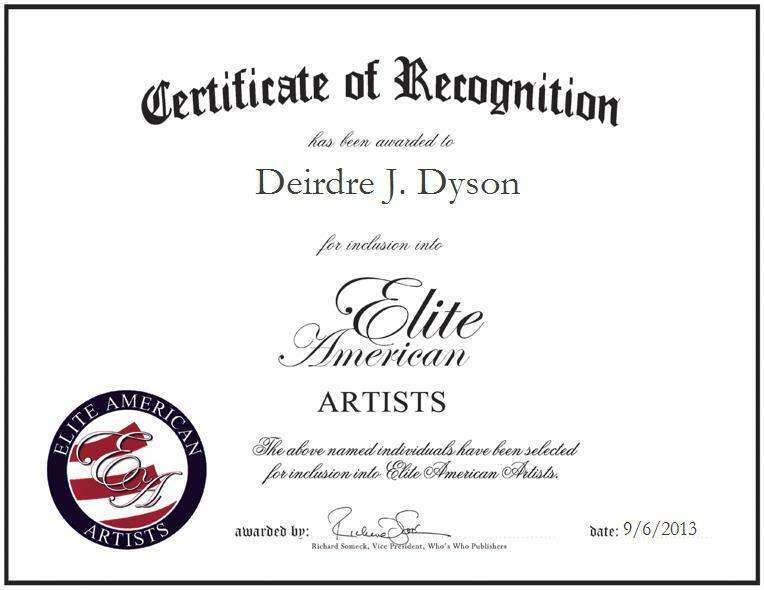 LOVELAND, OH, September 6, 2013, Deirdre J. Dyson, Professional Artist and Owner of Art House II, has been recognized by Elite American Artists for dedication, achievements, and leadership in the fine arts. At the helm of her art gallery and studio based in Loveland, Ohio, Ms. Dyson demonstrates her lifelong love of the arts with work that is based on nature, landscapes and cityscapes. She creates beautiful pieces and reveling in the splendor and magnificence of the world around her from a small cluster of blossoms or leaves to wide vistas of mountains, meadows and oceans. Her oil paintings demonstrate the passion that she has always maintained for conveying her view of the world in which she lives, through vivid and vivacious color, rich abounding texture, and the experienced eye for composition that can make even a mundane scene into a masterful painting. Ms. Dyson has work on display in her own gallery at her studio, and she also shows her work elsewhere. She predominantly paints in oils. Her other love is working in the performing arts as designer and director. She has garnered a reputation of distinction and prominence for her innovative, colorful and creative work. Ms. Dyson has received a number of Community Theater Awards, and she is also a recipient of the prestigious Mario Pipotto Award. She was recently named a VIP of the Year in the Fine Arts by Worldwide Who’s Who. With a wealth of knowledge and experience in the fine arts, and a highly respected name in her field, Ms. Dyson continuously strives for excellence in her every endeavor.